Oct - 05 | By: Eastern Oregon Film Festival | no comments. [La Grande, Oregon] The Eastern Oregon Film Festival will celebrate its 3rd annual event October 20-22 in beautiful downtown La Grande, Oregon. The 3-day event features 2 spectacular independent films — 10 features and 10 short films, 7 of the Northwest’s most notable up-and-coming indie bands, and 3 after-parties at some of La Grande’s best venues. 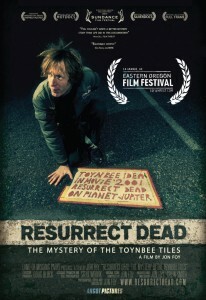 Featured films for this yearʼs program include the NW Premiere of Jon Foyʼs Sundance winning documentary ʻResurrect Dead: The Mystery of the Tonybee Tilesʼ, the West Coast Premiere of Tristan Pattersonʼs moving and intimate SXSW winner, ʻDragonslayerʼ, and Evan Glodell’s innovative and thrilling low-budget phenom, ʻBellﬂowerʼ. The West Coast Premieres of Sophia Takal’s ‘Green’ and Dustin Guy Defa’s ‘Bad Fever’ , as well as the World Premieres of Travis Swartz’s ‘Nobody Cares’ and Ian Clark’s ‘Country Story’ will provide a rich indie flavor for this year’s menu. For a complete list of this year’s films and events please visit the official festival website. EOFF has also selected its first foreign film, ‘Cirkus Columbia’, directed by Danis Tanovic. Continuing last year’s trend of fostering dialog around social issues, Oregon Rural Action will be presenting Bill Haney’s environmental / political documentary, ‘The Last Mountain’. ORA will also facilitate a panel discussion after the screening. Filmmakers Jon Foy (Resurrect Dead), Travis Swartz, and Ian Clark will be presenting their films and facilitating Q&As after their features, while many other directors will be tuning into the Grande Ronde Valley via innovating and engaging SKYPE Q&As. EOFF is known for its ability to bring cutting edge, award-winning cinema, and emerging and exciting Northwest music to Eastern Oregon. This yearʼs music line-up includes some of the best up and coming NW musicians. After parties will feature the likes of Portlandʼs Jared Mees & The Grown Children, Boiseʼs Hillfolk Noir, Finn Riggins, and Atomic Mama, La Grandeʼs own, Elidila and Sons of Guns, and from Pendleton, Oregon – J.D. Kindle & The Eastern Oregon Playboys. Times and schedules are available on the festival website. Eastern Oregon Film Festival is a 501c3 non-profit organization dedicated to creating a cinematic experience in Eastern Oregon that promotes discovery, entertainment, and education via artistic exhibition and viewership. Through the mediums of independent film and music we aim to expand the cultural experience within our region. Many screenings are expected to sell out. Please buy your (ridiculously affordable) All-Access Passes on the EOFF website. Plan to attend this year’s festival in beautiful Eastern Oregon, October 20, 21, & 22 in La Grande, Oregon. Visit the festival website or connect to facebook/twitter to learn how to participate, attend, and interact at this year’s event. Visit: http://eofilmfest.com/ and follow us on Facebook and Twitter.